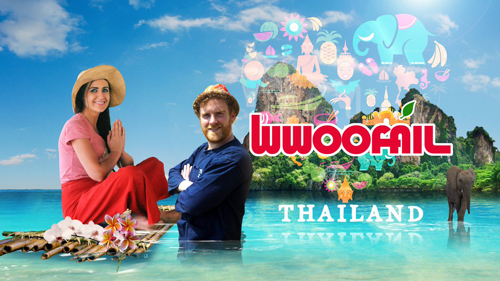 Presenters Mairéad Ní Chuaig and Tomaí Ó Conghaile journey to the exotic location of Thailand for a new series of Wwoofáil sa Téalainn on Thursday 5 April at 10pm on TG4. The 5-part travel series was produced by Stirling Film & Television Productions Ltd and received funding support from Northern Ireland Screen’s Irish Language Broadcast Fund. Mairéad and Tomaí take a road trip across Thailand through the world of organic farming, where they roll up their sleeves and get their hands dirty in search of new adventures. Their escapades demonstrate once again that people, no matter what their age, can travel and learn new skills on a tight budget. The award-winning series begins in Nakhon Nayok, a small province in central Thailand off the beaten tourist trail, before journeying south to Koh Lanta, a tropical island in the Andaman sea. Our intrepid travellers attempt to build bamboo and mud huts, harvest herbal tea and deal with all the hazards of living in the middle of a rainforest. The pair eventually make their way to the ancient cities of Chang Rai and Chang Mai in the far north of the country. They stay at a recovery centre that uses meditation and yoga to treat drug addiction before visiting Pai; a haven for backpackers situated high in the mountains near the Burmese border where they spend a gruelling week working with elephants. On the final stretch of their journey, Tomaí and Mairéad return to the capital city of Bangkok to work on an urban farm, learn how to fight Muai Thai and go back stage at Thailand’s world-famous Lady Boy show. Téann láithreoirí Mairéad Ní Chuaig agus Tomaí Ó Conghaile ar thuras chun na Téalainne sa tsraith nua Wwoofáil sa Téalainn Déardaoin 5 Aibreán, ag 10i.n. ar TG4. Tá an tsraith cúig chlár á léiriú ag Stirling Film & Television Productions Ltd, sraith a fuair maoiniú ó Chiste Craoltóireachta Gaeilge Scáileán Thuaisceart Éireann. Tugann Mairéad agus Tomaí faoi thuras bóthair ar fud na Téalainne isteach go saol na feirmeoireachta orgánaí mar a luíonn siad isteach ar an obair agus iad sa tóir ar eachtraí nua. Léiríonn na heachtraí seo arís eile, gur féidir le daoine, is cuma cén aois atá acu, taisteal agus scileanna nua a fhoghlaim ar bheagán airgid. Is in Nakhon Nayok, cúige bheag i lár na Téalainne i bhfad amach ó shiúl na dturasóirí a thosaíonn an tsraith a bhfuil duaiseanna bainte aici. Ó dheas leo ansin go Koh Lanta, oileán trópaiceach sa Mhuir Andaman. Féachann na turasóirí cróga le botháin bhambú agus dóibe a thógáil agus tae luibhe a ghabháil le linn dóibh a bheith ag iarraidh dul i ngleic leis na contúirtí a bhaineann le saol na foraoise báistí. Faoi dheireadh, baineann siad amach cathracha ársa Chang Rai agus Chang Mai i bhfíorthuaisceart na tíre. Stopann siad ag ionad téarnaimh ina gcleachtar machnamh agus ióga chun andúil drugaí a leigheas. Tugann siad cuairt ansin ar Pai: is tearmann ag turasóirí mála droma é in airde sléibhe láimh le teorainn Bhurma agus is ann a chaitheann siad seachtain chrua dhian ag obair le heilifintí. Ag tarraingt ar dheireadh a dturais dóibh, filleann Tomaí agus Mairéad ar Bangkok, príomhchathair na Téalainne, chun a bheith ag obair ar fheirm orgánach, foghlaimíonn siad stíl troda Muai Thai agus téann siad ar chúl stáitse ag seó Lady Boy na Téalainne a bhfuil cáil dhomhanda air.